John Mullane still expects Limerick to challenge for this year's All-Ireland title despite last weekend's loss to Clare eliminating them from Munster final contention. Prior to the Treaty county's final round robin fixture, Mullane tipped them to be Galway's main contender for the Liam MacCarthy Cup. And even after John Kiely’s men missed out on a place in the Munster final, he reaffirmed his opinion on the Throw In, Independent.ie’s GAA podcast. Limerick were well beaten on a scoreline of 0-26 to 0-15 after a player from each side was shown a red card early in the first half. Tom Condon and David Reidy, from Limerick and Clare respectively, were shown the line for off-the-ball incidents and Mullane cited Kiely’s subsequent tactics as a major reason for his side’s loss. "I think the sending off, particularly for Limerick, had a big bearing on the game," he said. "The fact that they lost a defender and then Sean Finn going off didn’t help their cause either. They had one of two choices at half time. Do they persist with going five-on-five or do they bring back a sweeper? "I think they possibly made a mistake. I would have gone with five-on-five and I would have said to Gearoid Hegarty, 'well look, you drop deep'. "They are evolving. They are going long and they are going short but I think they played into Clare’s hands yesterday. Clare won an All-Ireland with this short game and I think it was the winning of the game." 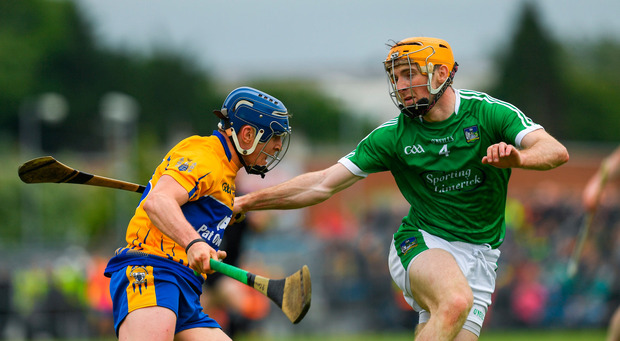 Mullane thinks that fatigue was also at play in Limerick’s loss. While he played in a less busy Munster Championship format, before the introduction of the round robin, he felt first hand the effect playing three weeks in a row had on his team back in 2007. "In 2007, the All-Ireland semi-final, we had played three weeks in a row and Limerick had the extra week and we were sitting ducks," he recalled. "From a Limerick point of view, what was the main thing that was getting them over the line in a lot of these games? It was a high work ethic, a lot of energy and I didn’t see that in abundance (against Clare). "I wouldn’t dismiss them just yet. Up to that game, in the three games (against Waterford, Tipperary and Cork), I thought they were excellent. "Two weekends in a row is doable but three weekends in a row, I think it’s more the mental block. When you’re up, you have to come down to do it again."